This is a graded series on art and activity and comprises a set of 11 books A, B, C and 1 to 8. Each book is the journey of art and craft that starts with a doodle, the first exploratory step towards the refined creation of visual arts. Sketching and doodling improve comprehension and creative thinking. Well-graded art activities such as sketching, shading, drawing and colouring have been included for the ease of comprehension of techniques. Video links are also provided for students to view Rob’s demonstration of the activity from the MAD show. From class 3 onwards, Rob’s craft projects, taken from multi-award winning MAD show on POGO, have been included in the curriculum. 1.Interesting Facts and Cool Facts–provide extra information along with the activity. 2.Do You Know–gives answers to the curious minds of children. 3.Fact-o-file–provides interesting facts in between the activities. 4.Rob Speaks–Rob gives useful tips to teachers related tot he activities. 5.For the Teacher–useful teaching techniques for the teacher. 6.Art Glossary–provides meanings of difficult words. 7.Step-by-step Instructions–to make activities easy to understand. 8.Integrated and thematic approach to various art forms. 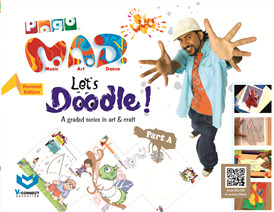 9.Interesting and fun-filled activities from award winning MAD show on POGO channel.